“Yes, are you kidding?” replied Bronx sculpture and mixed-media artist Sean Paul Gallegos when asked if he still rummages through the trash for his art materials. He is happy to emphasize, however, that donations are welcome. The art Gallegos creates involves deconstructing and tearing apart brand name sneakers in preparation of molding them into artwork using sewing, stitching, and embroidery techniques. Gallegos favors Nikes and Air Jordans, iconic status symbols. Gallegos’ current exhibition, Stations of the Lost, opened on December 7th to a well-received crowd in the Project Room at the Longwood Art Gallery at Hostos Community College in the Bronx. 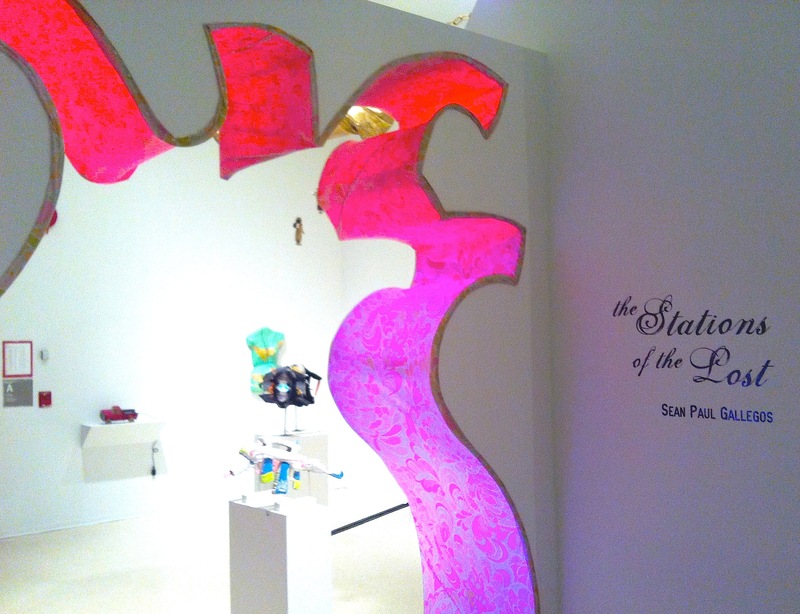 Stations of the Lost is Gallegos’ first solo show, and the Bronx Council on the Arts has curated it. A small wall in the shape of a giant, human heart welcomes viewers into the gallery space. “The same way in is the same way out — through the heart,” said Gallegos, as he touched his chest and walked into the gallery. Entrance to Stations of the Lost Exhibit – Photo Phineas Azcuy, 2011. In his show, Gallegos brushes upon religion through a variety of mixed media that tells the final story of Jesus Christ. Inspired by the Biblical Stations of the Cross, Stations of the Lost makes reference to the final hours of Jesus Christ leading up to His crucifixion and death. While still completing Stations of the Lost, Gallegos agreed to meet in his studio as he continued to work on many of the unfinished pieces. “You’re getting to see how all the decisions are made for this show,” said Gallegos, a 34-year-old New York resident, who has lived in the Soundview neighborhood of the Bronx for 13 years. In his apartment, the artist has transformed his kitchen into a small art studio he works out of. 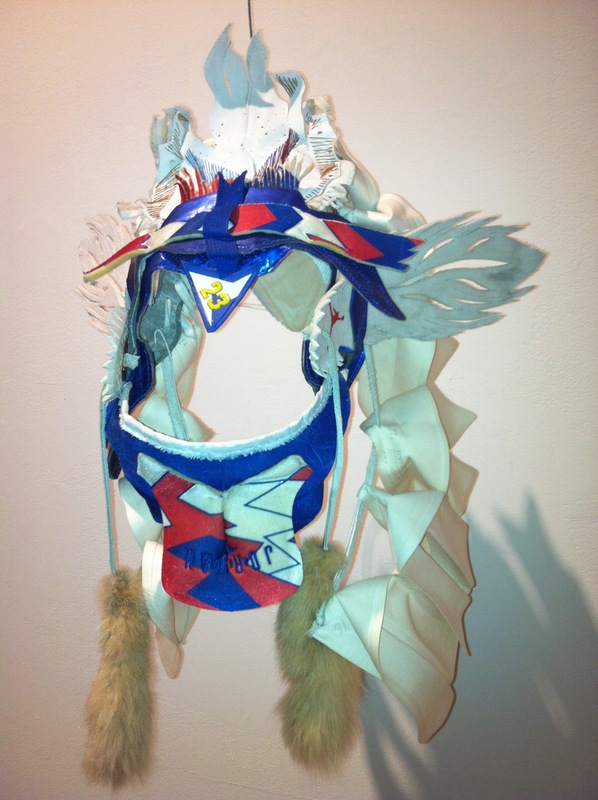 It is here where Gallegos crafted “Reserved Ancestry,” a Native American headdress made out of Air Jordans and arrow collars. This piece represents the fourth Station of the Cross signifying Jesus being denied by Peter, the apostle. However, Gallegos does not stop there. In addition to being on display, two of his masks will be hanging in mid-air and supported by wires, allowing gallery patrons to step into them and try them on. “Reserved Ancestry” is one of them. Gallegos likes people viewing his art to have a hands-on and interactive experience. “Reserved Ancestry” – Photo Phineas Azcuy, 2011. Earlier this year at the Bruckner Bar and Grill, the waitress asked Gallegos if he had any use for 40 pounds of bottle caps. Everyone present burst into laughter as she justified her question by chuckling, “You’re artsy.” Who else could she have asked? At the time, Gallegos was participating in a local Bronx group show. Since then, Gallegos has been profiled by The Daily News and participated in the Governors Island Art Fair. As a child, Gallegos began sewing costumes for his Teddy bears and learned how to operate his mother’s 1983 Kenmare sewing machine. This was the beginning of something. More than 25 years later, his résumé is filled with work experience relating to garment construction and patterning. Gallegos was raised on a Native American reservation in New Mexico. His mother was part French-Canadian and part Native American of the Cree tribe, one of the largest in North America and Canada. His father was Spaniard, as well as part Tewa tribe, of the Pueblo American Indians originating from New Mexico. 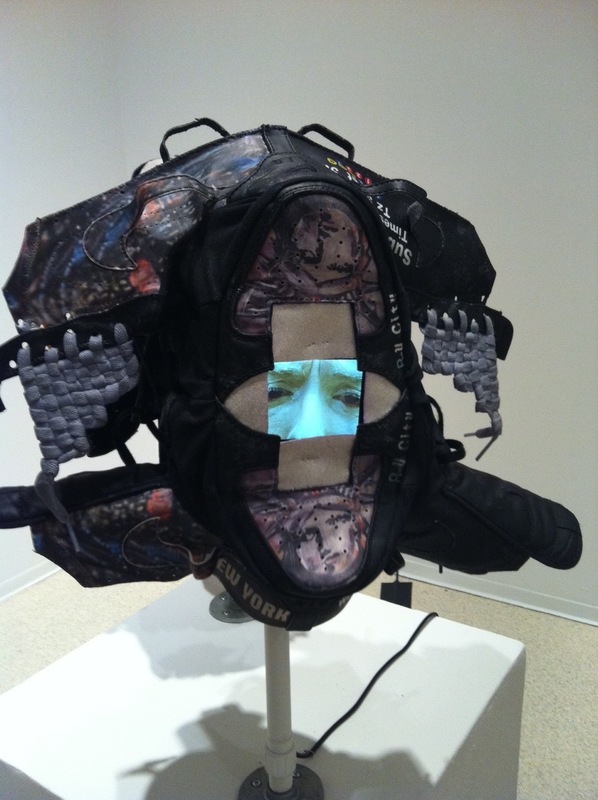 Before the opening of his show, Gallegos allowed to be watched as he continued to mold his seventh Station of the Cross being constructed out of a pair of Nikes and a video installation entitled “Forward March!” As he worked on one side of a mask, he spoke about how important symmetry is. “Forward March!” – Photo Phineas Azcuy, 2011. At his art opening held on December 7th, “Forward March!” received a lot of attention due to the video installation incorporated into the warrior-like, black mask. “This is an apocalyptic version of commercialized sportswear in the future,” said 51-year-old Ayodele Maakheru from Harlem, who stumbled upon the show leaving his French class. “It reminds me a of [the film] “Mad Max” and a movie called “A Boy and His Dog.” Maakheru is a former recipient of the BRIO (Bronx Recognizes Its Own) Award for music composition, sponsored by the Bronx Council on the Arts. 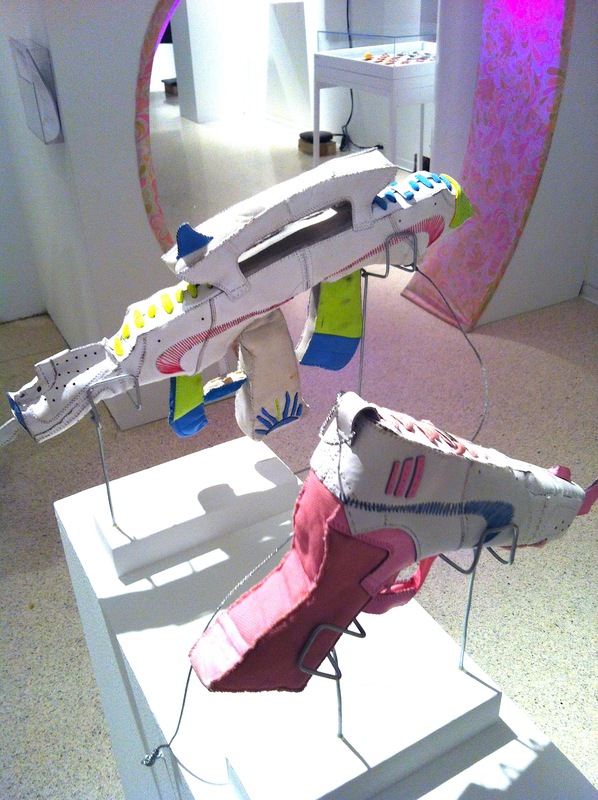 For the thirteenth Station, symbolic of His death, Gallegos gives us two sculptures made from Nike Air Force 1s of an AK-47 and a Glock pistol titled “Know Answer 1” and “Know Answer 2,” respectively. “Know Answer 1” and “Know Answer 2” – Photo Phineas Azcuy, 2011. In a time when the economy and the environment are important and relevant topics, eco-friendly art that pushes the boundaries of religion through used sneakers and discarded materials definitely plays a role in keeping the art world grounded. It is a reminder that the Divine is truly everywhere — even where we step.